A New Year and a new venue! 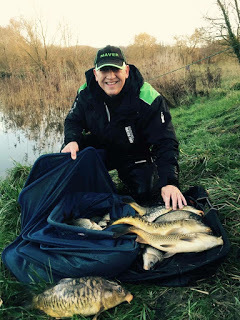 Harry Hebditch started fishing our matches a few months back and he has an irrigation pond on the farm which he holds occasional charity matches on and with nothing in the club book for this weekend we asked him if we could fish it and he very kindly agreed. 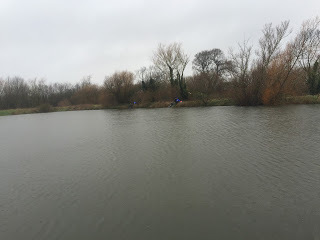 He also suggested we pop out and had a look over the Xmas period, all I knew about it was that the pond contained a good head of carp and previous matches have been won with weights between 80lb and 140lb. Rob, Frank and me met Harry in the week and had a walk round and it did look nice with lots of features and quite a few fish moving about. As there are some lumps in there, Harry said he wouldn’t fish so he could be on hand to weigh any big carp and return them straight away. He did go down and try his new pole out on News Years Eve and bagged up with over 46lb of carp caught in just a couple of hours and by now all the anglers who were fishing the match were chomping at the bit! We all met at the Cartgate for something to eat at 8:00 and leaving the house at 7:15 in the dark was a bit of a shock to the system! It was also lashing it down and pretty windy so we could be in for a rather cold and wet day! I have to say the breakfast was really good and well worth the money, so with our bellies full, it was time to pay our money and do the draw. The pools today were £20 from which £5 went to a charity of Harry’s choosing, we then put £10 a head into the overall pools and also had a £5 silvers pool as they were a bit of an unknown quantity. I really fancied drawing on the near bank but of course ended up on peg 12 which was opposite where I wanted to be! We got to the pond and Harry had done a fantastic job of strimming the paths and pegs, although with the seemingly relentless rain, the path was getting boggier by the minute. As I took my kit round the pond I passed Scotty and Frank who had the wind and rain straight in their faces and I must admit I didn’t envy them one bit! Rob and Hurf up the other end would have no such problems in their armchair pegs with the wind off their backs and the biggest worry they would have all day would be trying not to laugh at the rest of us! Frank and Scotty on the bottom bank with the wind in their faces! I wanted to try and keep things simple today so would fish two lines, a 0.4 gram Drennan Carp for on the deck at about five metres and a little handmade float for the margin line to my left, also with it being so mild (before today! ), I set up a shallow rig as I thought it might work, especially after we’d seen so many fish topping on our initial walk round. On my side tray I had a tin of Bait-Tech Scopex corn, maggots, SSP Dark Silt 2mm pellets which I’d soaked the night before and 6mm SSP Beige Gravel pellets. On the whistle I fed some micros in the margin and the same but with the addition of a few grains of corn at five metres before starting there with corn on the hook. Scotty, Frank, Justin on my right and Jake on my left all chucked either the method or a lead out. I thought I’d catch quite quickly but after ten minutes I hadn’t had any indications, the wind was a nightmare and I was struggling to hold five metres of pole! After an hour I was still blanking, Scott had caught six or seven carp on popped up bread, Frank had a couple and Justin had one on the method and already it was looking like I’d got it horribly wrong! I had a quick go down the edge with banded pellet but I wasn’t confident as the fish seemed to be in deeper water, I also tried my shallow rig at ten metres but that was a waste of time as well, so it was back to the five metre line. It was still raining really hard and my hands were starting to get cold so for the first time in ages I put my gloves on and also my flask was emptying at an alarming rate! After an hour and a half, I still hadn’t had a bite, Jake had caught a couple of carp on the tip and when Harry came round and said I was the only person who hadn’t caught yet, I had to do something. I could see Stu Alford and Ash on my left getting odd fish on the long pole so I plumbed up at ten metres and then faffed about getting a suitable rig sorted before cupping in some micros and corn on this new line. Justin came up and said he hadn’t added to his early fish and Frank was still stuck on two so it wasn’t just me who was struggling. Just after the two hour mark, I’ve finally had a bite on corn and was soon netting my first carp, it was a long lean fish that looked like it should weigh 4lb but would probably go half that. I had another and then missed a bite and with rain easing up, I was actually starting to enjoy myself and then Rob blew the whistle for us to stop fishing for the half time weigh in, although only a couple of anglers had caught enough to warrant it, Rob was one and got out of his armchair to stick just over 25lb on the scales and Hurf was the other and put his gin and tonic down long enough to weigh 10lb odd. While we waited for them to weigh in, a few of us congregated around Jakes peg and compared notes, Jake had four carp, Stu Alford said he around the same and Ash was admitting to ten carp so apart from him I wasn’t actually that far behind on our bank. With another toot from Rob, we were off again and as I laid the rig in, just as it was settling, the float went and carp number three was making a bid for freedom. Any thoughts of bagging up soon disappeared when I went another twenty minutes without a bite. I didn’t really know what to do next as I knew I was way behind Ash, Rob, Fieldy and Scott and as we were paying the top three overall any chance of framing was disappearing fast. 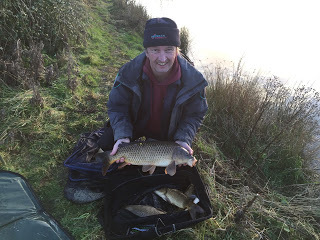 We were also paying the top three in silvers and the only angler I could see who was getting a few was Roger over on peg 1 who was catching some small rudd so as it stood it wouldn’t take a lot to sneak into the silvers frame. I slipped two red maggots on which I thought would give me a chance of silvers and carp and also attached a little Frenzee Soft Pot to my top kit so I could feed a pinch of micros and a few maggots every put in. The next bite didn’t result in a roach though but another carp and I actually started to catch quite well again, Justin fed a similar line and he started to get a few fish as well, we were never going to catch the early leaders but I still had two side bets to fish for! I got to eight carp but then things slowed up again, with forty minutes to go the float slid away and the strike saw solid resistance and this felt like a much bigger fish. After a ten minute scrap I slid the net under a fish that I thought was 8-10lb, I couldn’t weigh it though as Harry had gone back to the farm so with only half an hour to go I popped it in the keepnet. I missed the next bite but with quarter of an hour to go I had carp number ten, we were due to finish at 3 ‘o’ clock and with a minute or so to go, there was a dip on the float which had me saying “go on, go on” under my breath and bang on time the float went and I struck into my eleventh fish. I kept waiting for the final whistle but it didn’t come so I landed the fish and quickly went back out again, I checked my watch and it was about five past three but looking round the pond everybody was still fishing and then Rob shouted that we would fish until quarter past to make up for the mid match break. 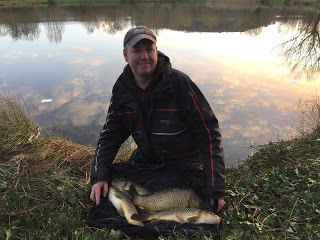 I managed one more carp to give me a dozen for the day and I thought I probably had around 40lb (eleven carp at an average of 3lb plus the bigger one of 8lb or so). The scales on our side started at Hurf who had 33lb 14oz from peg 6, then Gordon had 4lb 4oz of carp and 7oz of silvers, Leighton had 19lb 13oz and Ash had a level 32lb, Stu Alford had 18lb 5oz from peg 10 and Jake didn’t weigh. 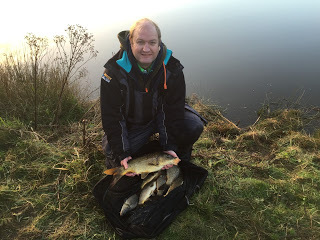 Then it was my turn and I was a bit disappointed when the biggest fish only went 7lb 8oz and after two weighs my total of 31lb 15oz was way off my estimate and those fish were nearer 2lb apiece then 3lb. As far as the side bets, it was a case of easy come, easy go as Stu gave me a pound which I gave straight to Hurf! 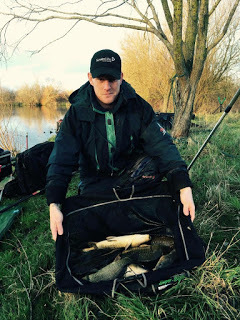 Justin had 13lb, Frank didn’t weigh before Scotty had 51lb 12oz from peg 15. The scales finished weighing the other section and Fieldy had caught all day for a comfortable win with 80lb 6oz and Rob was second with 56lb 9oz which meant Scott finished third. 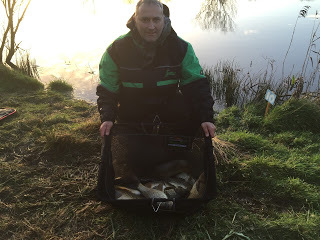 As expected Roger had won the silvers with well over 100 small rudd for 5lb 4oz, Karl Aplin finished second with 1lb 2oz and his Dad only needed 7oz for third. So apart from the weather early on, it was a really enjoyable day and if I hadn’t got it so badly wrong for the first two hours, I reckon I would have been a lot closer to the framing weights. A massive thanks to Harry for letting us fish and I’m looking forward to fishing the next one already when hopefully the weather will be kinder to us. Also I’ve entered the blog in the UK Blog Awards and I’d be very grateful if you could take five minutes just to click on the link and vote for me in the lifestyle and travel categories. Happy New Year Jamie and thanks for your comment on my blog. I got one of those new Steve Ringer pellet band tools that you reviewed recently, lovely piece of kit. Hope to meet up in the spring at Summerhayes.